Searching for fun birthday parties in MN? It’s never simple to plan anything for any teen. Many parents will agree that when their kids become teens, it’s hard to find activities to please them. If you’re searching for a method to celebrate together with your teen, you’ll be relieved to find fantastic places to throw memorable and fun kids birthday parties in MN. Why A Paintball Birthday Party? As your child gets older, the traditional birthday party destinations–Chuck E Cheese, Skyzone, etc–just don’t cut it for teens. Your teen sees their birthday as a milestone in they journey to becoming an adult and they want an activity that isn’t “kid stuff”. Paintball isn’t ‘kid stuff’ to them. It’s an adrenaline packed activity that mimics some of the most popular video games. Paintball is basically the adult version of Nerf battles. Best of all, paintball is an activity that doesn’t need any previous experience. Anybody who has played with water pistols will understand the basic rules of paintball. When you think about paintball, your first thought is whether or not it hurts to get shot. We use a low impact version of paintball that uses a smaller ball fired at a lower velocity than a traditional paintball. The low impact paintball has 60% less felt impact, making it a great way to introduce new players to the game of paintball. 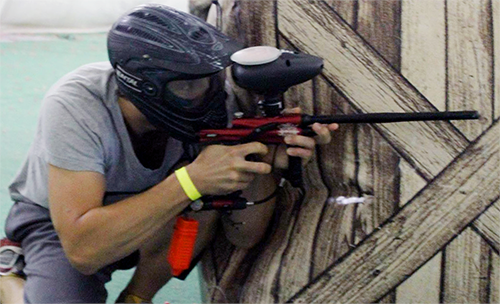 This new format of paintball is suitable for players as young a nine years old. Planning paintball birthday parties in MN is as simple as a call to one of our paintball party experts. They’ll walk you through our reservation process and will answer any questions you might have. Please give us a call at 612-378-0385 to reserve your spot today. Don’t have enough players for your own private party? We also offer walk-on play sessions throughout the week. Walk-on sessions are a great way to mix in with other players of a similar experience level and play with a larger group of players. All players who participate in paintball games at Splatball must fill out a liability waiver. Players under the age of 18 must have their waivers signed by a parent or legal guardian.